Search all mansions for sale in Beverly Hills, CA. Find stately mansions and ultra-luxury properties for sale below. Mansions on this page exceed 5,000 square feet (interior size) To view all homes, regardless of size, check out the main Beverly Hills home search page. Panoramic views, privacy, and grandeur attract buyers from around the world to the Beverly Hills real estate market. It's one of the best areas for home buyers to consider if they enjoy the convenience and amenities that come from living in a major metropolis. Be sure to register for a free account so that you can receive email alerts whenever new Los Angeles listings come on the market. Beverly Hills needs no introduction; it's reputation among high net worth individuals is well-known the world over. No doubt you know about the high-end shopping on Rodeo Drive and the abundance of ultra luxury homes, mansions, and estates nestled in the lush hillsides of the Santa Monica Mountains. The size of mansions for sale in Beverly Hills start at 5,000 square feet. The Mega Mansion moniker applies to homes from 20,000 square feet and up. 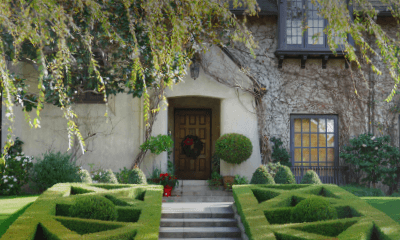 The architectural style of mansions in Beverly Hills include Spanish, French, Custom Built, Contemporary, Tudor, Mediterranean, Traditional, and Modern. Home buyers can expect amenities such as tennis courts and swimming pools. Inside, you'll find gourmet kitchens, formal dining rooms, and grand staircases. Gates and hedges provide additional privacy and security. You can also review exterior features like whether the home has a swimming pool or tennis court (most mansions have both). Lot sizes as well as the architectural style of the mansion is displayed. If any appliances or fixtures are included with the sale, those will also be noted. When available neighborhood information will be included along with local schools, walkability, and population within the 90210, 90211, and 90212 zip codes. This page shows all Beverly Hills mansion listings, both active and pending. To view only the active listings, use the search filters to select "active" above and then click the search button. The updated results will then display only mansions currently not under contract. If you're buying a home, our full-service Beverly Hills luxury real estate agents are at-the-ready to assist you. If you're selling a home in the Beverly Hills area, our listing agents will provide current market data, comparison properties (comps), and a highly-tailored marketing plan to make sure you get the best price for your home.